Missiria near Rethymnon brings you a long stretch of golden sandy beach, and plenty of opportunities to relax. It’s located on Crete’s north coast, and is within easy reach of the area’s larger resorts, including Rethymnon. Ideal for families, explorers, and couples, its main attraction is the beach, which gently shelves into the sparkling waters of the Mediterranean. Surrounding the golden sands you’ll find a lively selection of bars, restaurants, and shops serving up delicious Greek dishes, wines, cocktails, and offering a chance to buy souvenirs and gifts to take back home. There are watersports for the adventurous, as well as historic sights, and bustling towns within easy reach. Try scuba diving, sailing, snorkelling, banana boats, and lots more, or visit the nearby Archaeological Museum of Rethymnon or the Venetian Fortezza. When it comes to hotels there is a choice of modern properties throughout the resort. Holidays in Missiria offer the chance to enjoy a quiet, tranquil atmosphere within close proximity to some of the island’s larger towns and attractions. There are some excellent tavernas to choose from, each serving delicious local Greek dishes and a selection of fresh seafood caught straight from the Mediterranean. Just a 10-minute taxi ride away is Rethymnon where you’ll find Venetian architecture, an old town filled with colourful buildings and a further selection of shops, restaurants, and bars. Book your luxury holiday in Missiria with Sovereign and you can relax and make the most of its wonderful amenities, knowing you’ve picked the ideal accommodation. Each of our hotels has been carefully selected by our experts to ensure you make holiday memories to last a lifetime. Choose to stay at the Grecotel Creta Palace and enjoy its luscious gardens, elegant décor, fine dining, and tranquil spa. Families will love the Kids’ Club, water slides, and more. If you like walking, a visit to Samaria Gorge is a must-do. It's a beautiful national park and has some exciting trails through the hills, forests and river beds. The aim here is to spot the 'Kri-Kri', an endangered wild goat that is very rarely seen. Flight time from the UK to Crete is around 4 hours. Transfer time from Heraklion airport to Missiria is approximately 1 hour. The southernmost Greek island, Crete’s summers are something special. The temperatures are beach-worthy by April, climbing steadily throughout summer and peaking in July and August, when highs of 35°C are possible. Luckily, the island is prone to some cooling winds during summer that stop things getting too hot and sticky. Currently visas are not required for UK citizens travelling to Greece. In Greece, a service charge will be included in the bill at restaurants and bars. Much like the UK, an additional tip is not required, although is appreciated for particularly good service. It is common to round off the amount when paying cash, particularly with wait staff and taxi drivers. The official language of Greece is Greek. English is widely spoken, too, so getting by is easy. 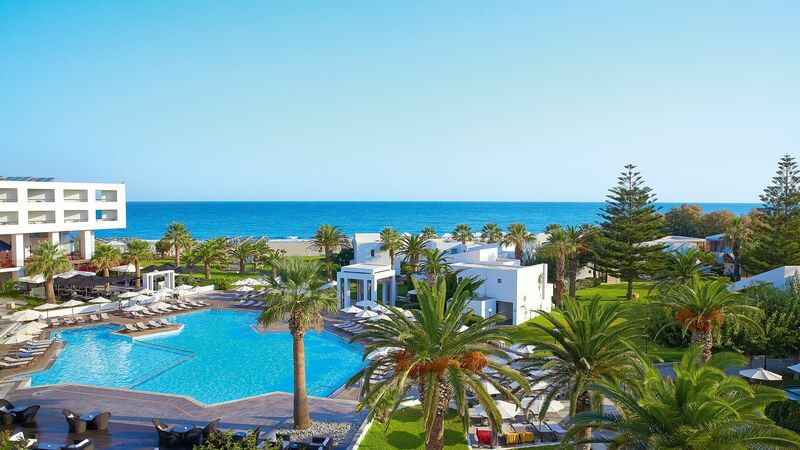 *The saving of up to 20% per booking applies to two adults sharing at the Almyra Hotel, Cyprus for departure date of May 14 2019 from London Gatwick for a duration of 7 nights. The saving applies to new bookings made from1 April to 06 May inclusive. Normal booking terms & conditions apply. Flights from regional airports available. All offers are subject to availability and change. Full booking terms and conditions apply.